FILE - Syrian government troops fire at Islamic State group positions near Mahin, Syria, Jan. 30, 2016. The new division "will fight alongside other military units and our allied forces in Syria" and will officially allow civilians to take part in the fight for the first time, a Syrian government military official said in a televised statement this week. The decision was made "in response to the rapid development of events, to support the successes of armed forces, and to meet people's wishes to put an end to terrorist acts in the Syrian Arab Republic," the statement said. The unit, to be known as "The Fifth Attack Troops Corps of Volunteers," will consist of men and women over age 18 who are "not already eligible for military service or deserters," the statement said. 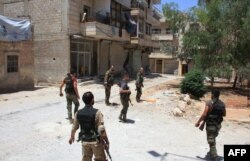 FILE - Syrian army soldiers patrol a street in government-controlled Aleppo's al-Khalidiya area where the army progressed toward the industrial zone of al-Layramoun and Bani Zeid, June 28, 2016. With nearly 5 million refugees abroad, and about 6.6 million refugees internally displaced, the pool of possible volunteers is greatly diminished. Syria has already pulled most 18-year-olds into mandatory service and their terms have been extended past two years as Syria's civil war continues. Thousands of young recruits, too, have reportedly deserted the army and fled the country, further depleting government forces. "I defected from the army the first chance I had," said Issam, a former Syrian solider who is currently in Jordan. He gave only his first name for fear of retribution. "I saw no end to the fighting. I realized that I would either get killed or kill more people," Issam told VOA in a phone interview. He said he was drafted into service in 2013 despite his status as a college student at Homs University. The Syrian military reportedly has more than 300,000 soldiers, with an additional 400,000 reserve members, most of whom are enlisted now. They are spread across the country, fighting various rebel forces as well as pockets of IS resistance. Salaries for the volunteer unit will range from $200 to $350 per month, according to local news reports. The government is encouraging civil servants to sign up. 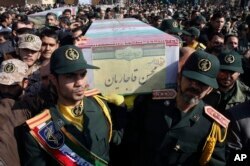 FILE - Civilians and armed forces members carry the flag-draped coffins of Iranian Revolutionary Guard Gen. Mohsen Ghajarian, foreground, and five soldiers who were killed in fighting in Syria, during their funeral outside the headquarters of the guard's ground forces, in Tehran, Iran, Feb. 6, 2016. Syrian government forces have relied heavily on foreign militias since the outbreak of the civil war in 2011. Iran and Russia have been staunch allies, with Russian bombers taking on a bulk of the aerial campaign and Iran providing ground forces. Elite Iranian Revolutionary Guard forces, along with Lebanese Hezbollah fighters and Afghan and Pakistan mercenaries, have fought alongside Syrian troops. In parts of Damascus and Homs provinces, Iranian-led troops have been the primary forces against rebels. But Tehran's commitment to provide additional servicemen to aid Syrian government forces has declined, analysts say. And an Iranian official said this week that Iranian troop casualties were mounting — over 1,000 dead since the start of Syria's civil war. "Iran is busy in other conflicts in Iraq and Yemen, and so its focus and resources could be shifted," Alika, the Syrian researcher, told VOA.